My wanderings have taken me from Toledo to Tokyo, Pittsburgh to Paris, Vacaville to Vienna, Charleston to Cologne. I have marveled at the wonders of the world, made my home in exotic locales, and forged bonds with people of many nations. 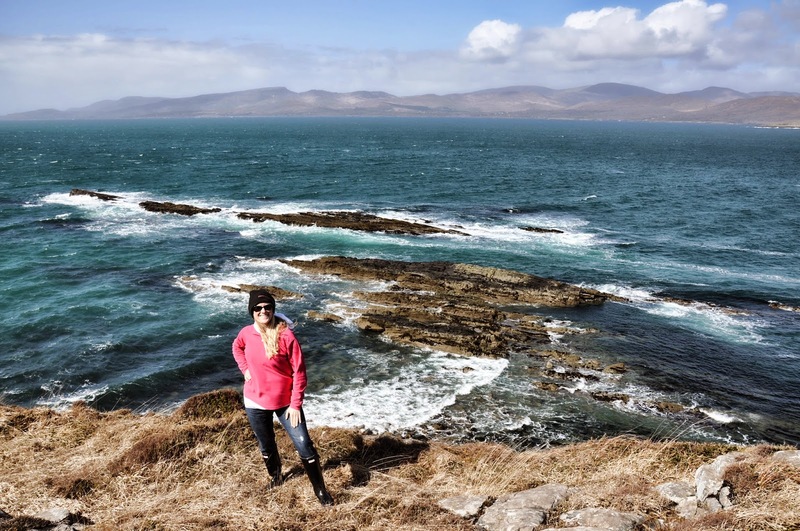 Of all my journeys, none has resonated with me as deeply as my recent trip to Ireland. I made a soul connection with the place and her people. This should probably come as no surprise to those who know me well. After all, I have an abundance of Irish DNA surging through my veins. The connection is cellular. I'm also an enthusiastic storyteller and conversationalist (a nice way of saying I have the gift for gab). There's usually one spectacular tour, museum, or site that attaches itself to my memory of a journey; one thing that makes a place truly unique. 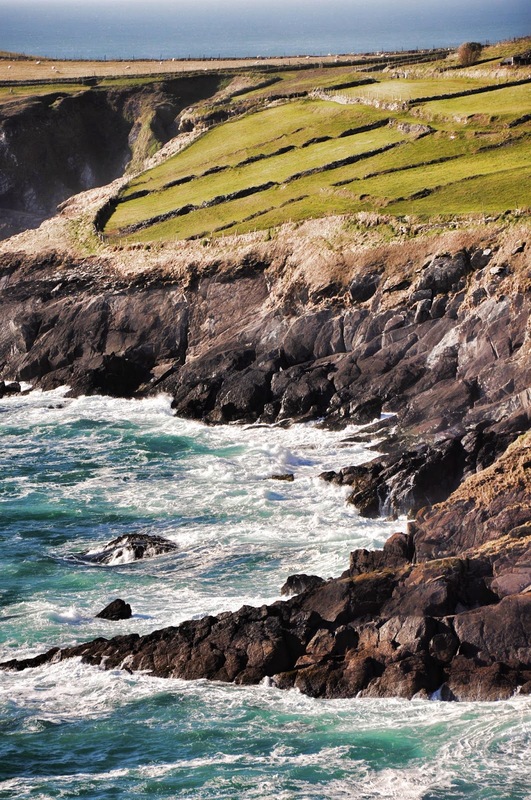 In Ireland, there were two things: her people and her coastline. I will write about her warm, friendly, beautiful people another time. Today, I would like to share my memories of her spectacular coasts. 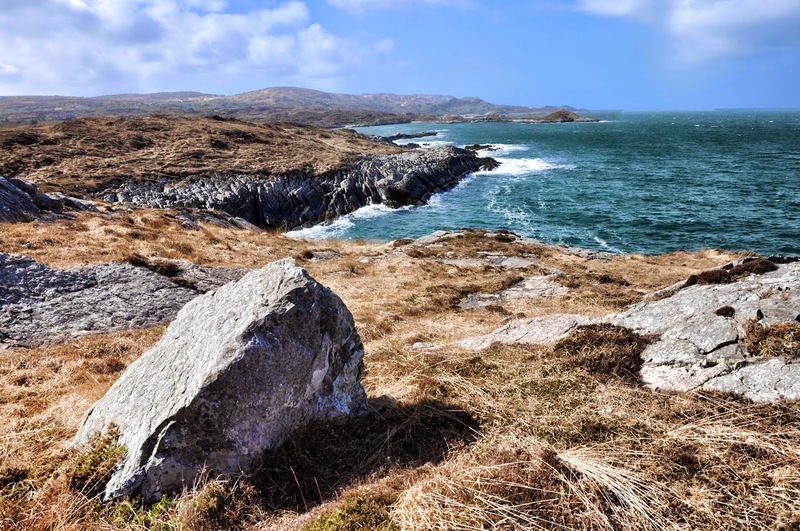 Better writers than myself have tried to describe Ireland's majestic land and seascape. I'll spare you the poetic waxing and instead share some of my photographs with you. 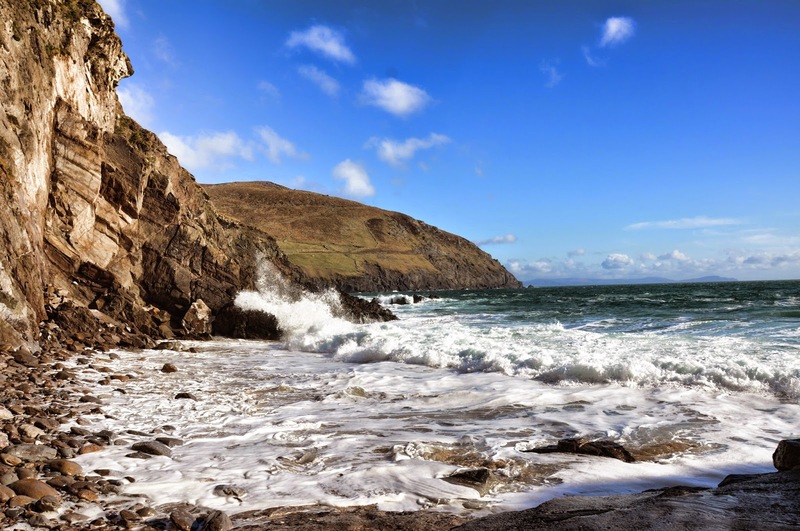 Unless otherwise stipulated, these photos were taken on the Dingle Peninsula. I stood on an abandoned boat launch, watching as the sun burst through the clouds and transformed the forbidding, churning sea into a magical body of luminescent water. I could have stood there all day, watching the play of light on water and listening to the roar of the waves as they crashed to the shore. 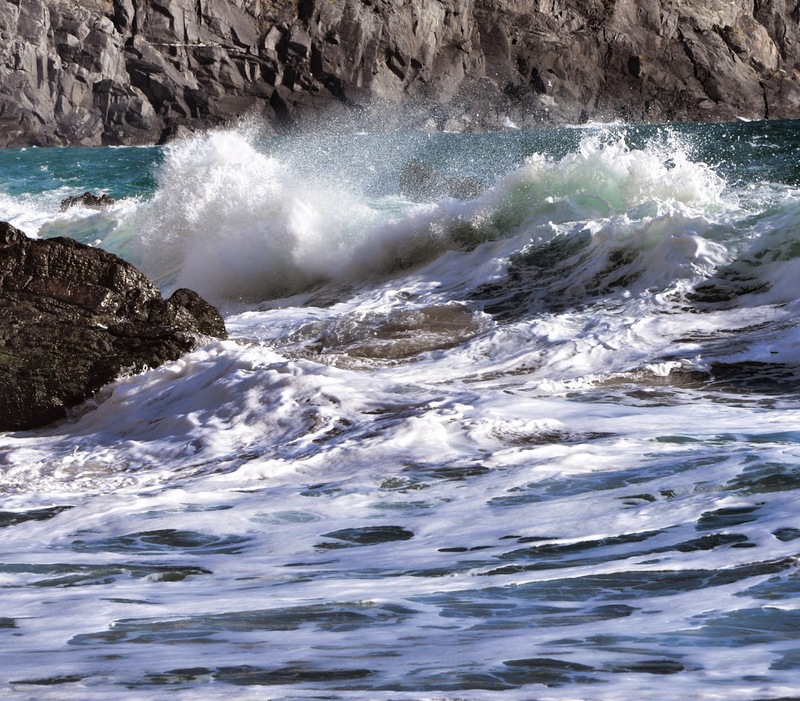 Have you ever stood ankle deep in the surf just as a powerful wave rolls to the shore, sending sea spray all over your face? I love the way the soft spray feels on my skin, like tiny kisses from the ocean. The modern world is such a chaotic, cloudy place. It's easy to feel lost in the commotion of life. I always find clarity - in my sense of purpose, my relationships, and my faith - when I stand by the sea and watch the awesomeness of nature. The first time I heard Amy Grant sing El-Shaddai, I was a confused teenager searching for a rock to cling to in the tumultuous sea of life. Her pure voice and lyrics brought tears to my eyes. 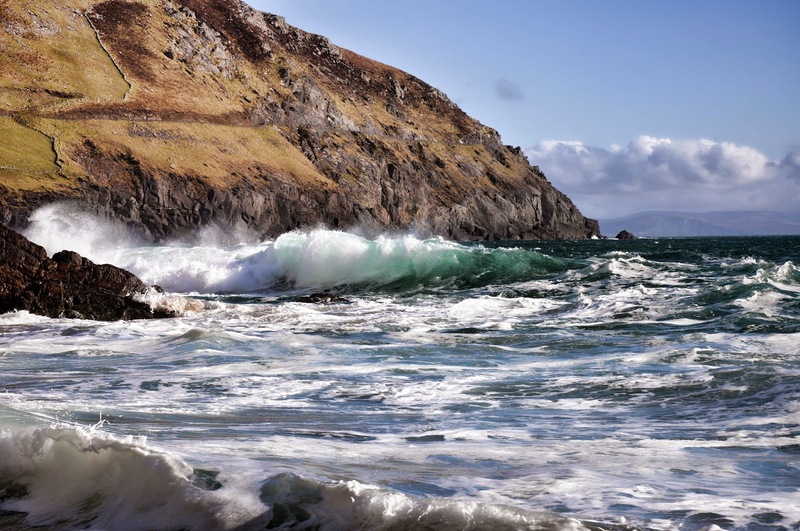 When I stood on the Baera Peninsula in Ireland, I recalled her lyrics and felt the familiar sting of tears behind my eyes. I looked at the rolling hills, ancient stones, and ageless sea, and thought about a Power so great it could bring such a landscape into existence. I thought about the thousands of people before me who stood in the same spot, staring out at the vast world, and marveling at their insignificant role in it. When I asked an Irish friend my chances of encountering a banshee, selkie, or fairy, he said, "'Tis not hard to find the mystical in Ireland. Just look for it where the land meets the sea." The former Taoiseach of Ireland, Charles Haughey said, "Ireland is where strange tales begin and happy endings are possible." 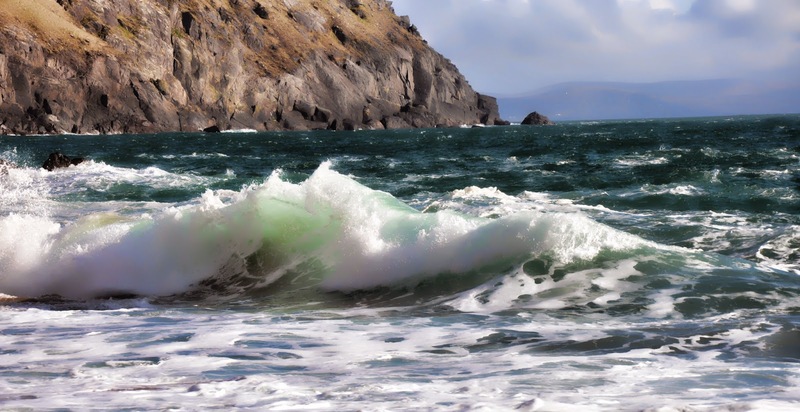 Watching this emerald wave rolling toward the ocher hills, I imagined many strange and wonderful tales. Tales of selkies swimming by day and then slipping out of their skins to shape shift into slender, beautiful humans by night. A shift of the light and I imagined their sleek heads bobbing in the waves. A gust of wind that howled and echoed in the caverns and I thought I heard their mournful cries. As for happy endings, I got mine the morning I met actor Colin Farrell in a little town called Sneem. I am working on a novel, aptly titled, Finding Colin Farrell, so my serendipitous encounter with him in a hotel lobby could certainly be considered the happy ending to my magical Irish adventure. I stood on the edge of the cliff while the wind tried to body check me into the sea. Any normal person would have felt a healthy dose of trepidation, but I felt strangely calm, content. My Wellies were firmly rooted on the land of my ancestors but my heart was soaring far above the emerald waves. After years of wandering, I was finally home. 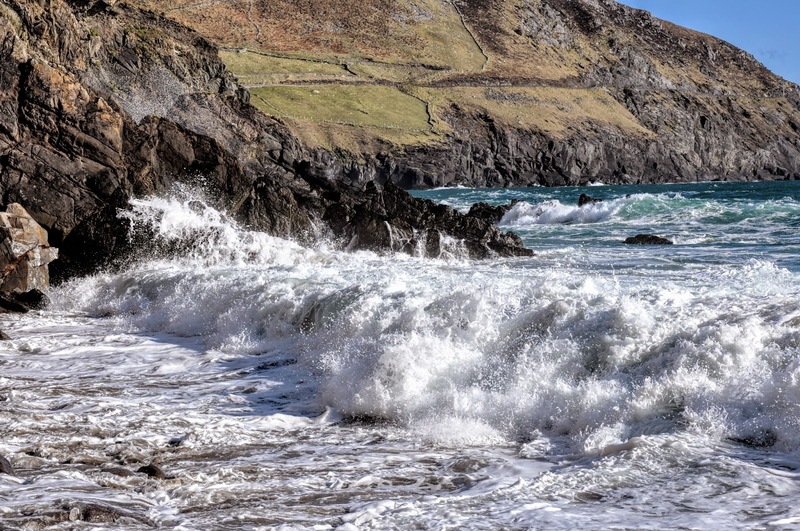 Photo taken on the Baera Peninsula, Ireland. Thank you for reading my post, your kinds words, and your company. 'Tanks a million! Your writing is always as evocative as your photographs. Your blog is the perfect alternative for those of us unable to travel. You bring the world to my computer screen. Thank you. My name is DeBorah Fuentes and I was your Flight Attendant from Dublin to Philadelphia recently. My supervisor told me you wrote a letter of praise about the service you received from me on that trip. Thank you for taking the time to write such a nice letter. It really was very kind. I enjoyed speaking with you during the flight. I hope you make it back to Ireland soon and I hope your Colin Farrell book is a huge success. Thank you again Miss Brown. I always enjoy reading your travel articles and seeing your gorgeous photos, Leah. You make the world come alive. Bon Voyage, talented writer and traveller.